Today at the Mobile World Congress at Barcelona, Microsoft has finally released its new operating system for mobile phones named as Windows Phone 7 Series. This is a very ambitious new product from Microsoft. 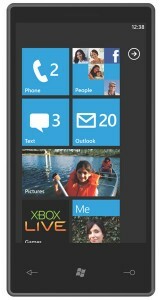 The Windows Phone 7 Series is a brand new in every sense. Microsoft have done away with almost all that has been done with their previous mobile efforts. The Windows Phone 7 Series represents a radical shift in Microsoft's mobile OS strategy. They have completely rebuilt everything right from the UI to the underlying codes. The entire UI has been handed a major change to resemble the Zune HD interface more closely. The "Start Screen" in previous versions has now been replaced by tiles which represent links to applications or contacts. Another major point to be noted with Windows Phone 7 Series is that this represents the first time Xbox LIVE and Zune have been integrated in a mobile platform. The Xbox LIVE integration includes games, avatars and profiles. The Zune integration is a copy of the Zune media player. The 7 Series also has a very significant focus on social networking. Users can post status updates and photos to multiple services at once, and updates from friends can be streamed to the home screen. Bing provides the default search and map services. It seems like Microsoft will be dictating rigid specs for 7 Series devices and hardware partners include Sony Ericsson, Samsung, Qualcomm, LG, HP, HTC, Toshiba, Garmin Asus, and Dell. Meanwhile, AT&T, Verizon, Sprint, T-Mobile, Orange, Telefonica, and Telstra are slated to offer Windows Phone 7 Series devices. The Windows Phone 7 devices are expected to be out before the 2010 holidays.